While pain and stiffness often go together, joint stiffness can occur on it’s own. Joint stiffness can limit your ability to perform usual tasks. For example, turning your neck to check behind you while driving. Stiffness can also be a warning sign that part of the body is vulnerable to future injury. There are actually many different causes of stiffness. We will explore a few of the reasons why you might not be feeling as flexible as normal. Our bodies are made to move. When we are not regularly moving them through their full range, they can begin to feel ‘tight’. This can be caused by a combination of the capsule that surrounds the joint tightening up and the muscles that surround the joint shortening and losing flexibility. Stiff and tight muscles can cause you to feel as though your joints are stiff, even if it is only the muscle length that is restricting the movement. 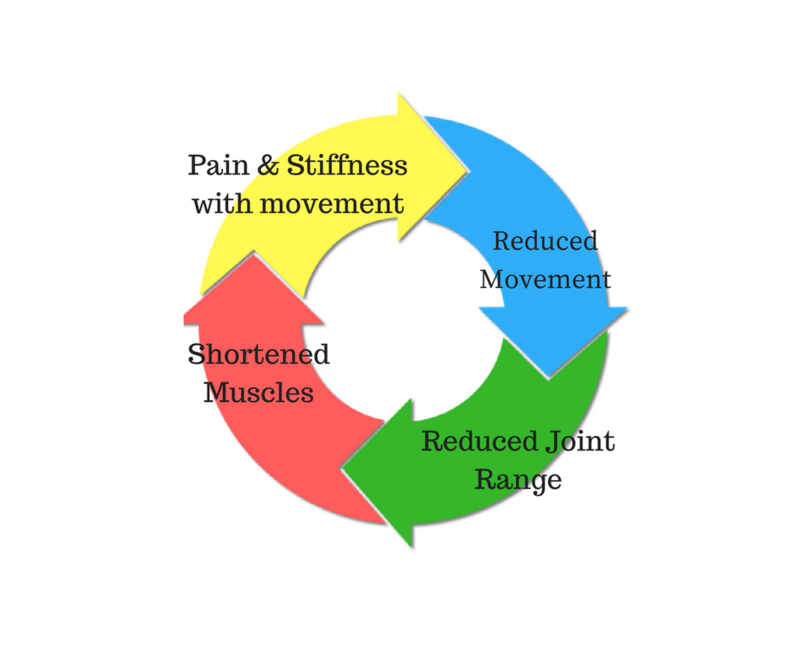 Joint mobilizations, manipulation and muscle stretches/massage can have a significant effect in improving the symptoms. The most important way to maintain full movement is to regularly move joints through their full range, which also helps to keep muscles and joints healthy. Your physiotherapist can advise you on how o best approach this with a targeted set of exercises. OA is a degenerative disease, characterized A person with OA will usually feel stiff for around 15-20 minutes after being still. Physiotherapy programs to strengthen the muscles surrounding the joints, so as to help absorb weight-bearing forces, has been shown to have positive results on OA symptoms. The inflammatory process is characterized by swelling and pain around a specific area. Usually this is a response to damage by the body. As an area swells, this will allow less space for movement and a sensation of stiffness, as anyone who has had sprained an ankle can attest to. Acute inflammation will cause swelling that increases over 24-48 hours and subsides gradually. Autoimmune disorders can cause the body to mistakenly have an inflammatory reaction where there has been no injury, with resulting pain and stiffness. Rheumatoid arthritis and ankylosing spondylitis are two examples of such disorders. Stiffness caused by inflammatory disorders is characterized by feeling of stiffness after rest, particularly in the morning that can take longer than 30 minutes to subside. Inflammatory disorders unrelated to injuries are complex in cause and require collaboration with medical teams for best treatment outcomes. Acute injuries are best managed by following RICE protocols (Rest, Ice, Compression, Elevation). Speak to your physiotherapist for more information regarding a specific condition. a breakdown of joint surface cartilage and the growth of bony osteophytes around areas of stress. While OA is increasingly common as we age, it is thought that the primary cause is abnormal load and stress to joint surfaces and not simply aging itself. As the joint space between two joint surfaces become uneven, joints affected by OA can feel stiff or even ‘blocked’.